If you suddenly became very wealthy, how would that impact your motorcycle riding? What bikes would you have in your dream garage? What kind of riding would you do? For myself, the first thing I would do would be to spend a lot of time going to various track schools and taking other motorcycle training courses. I would spend a bunch of time on the track working on skills and just riding track days for joy of riding fast in a safe, controlled environment. I would also spend a lot of time learning how to ride on dirt. I would like to learn how to wrench. Perhaps I would undertake a course of study at MMI. What would I have in my dream garage? After investing heavily in improving my riding skills, I would just get on the a Super Tenere and go everywhere. I would go camping in national parks all over the United States and Canada, and I would love to tour in Europe, Australia, New Zealand, and anywhere else that would become of interest. The biggest challenge would be to get Mrs. Hanson on the back of my bike so that I could share all of that adventure with the most important person in my life. If I had that kind of money, I would also do a lot of rally riding with the idea of eventually riding in the IBR. I would get into better shape, exercise more and loose some weight. After thinking about this, I have one last question. How many of your Moto Fantasies can you make come true even if you don't win the lottery? I know that even without a lot of money I can accomplish a lot of the things I would like to do with respect to motorcycling. If I eat less to drop some pounds, that will even save me some money that can go into the gas tank. I would have my Harley rebuilt and keep it, add a Victory Vegas and a Triumph Tiger 800xc. Way back when I started riding my Honda 305 Hawk a group of friends and I would ride everywhere. Dirt roads, trails, hill climbs anything we could do on our small under powered bikes was great fun. Now I see it's a legitimate riding stile with dedicated bikes; what fun. I would have a big twin Harley-Davidson to ride occasionally. I would have a Royal Enfield - maybe one of the new café racers. I would have an old slash 2 BMW airhead because I love the way they look. I would have a VFR1200, and have it set up properly. I would have a Guzzi - maybe a Griso. And I would have multiple dual sports. 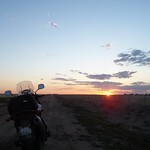 In addition to the sport-touring I do, I would have time to practice and get much better at off-pavement riding. Nothing extreme (too old and too many joint issues for that) but definitely dirt roads, fire roads, wider trails, etc. For riding, Europe and Russia for the history, heritage and culture. Would also love to see New Zealand, it's amazing riding I've heard as well. I've been lucky enough to own 1 CB, a CB400T and the Guzzi, and so far have got to ride in UK and Greece. I would take advanced rider courses, buy a home in a warm weather climate that I could ride year round, travel the east and west coastlines on my bike, attend a motorcycle repair school, and open a motorcycle gear shop anywhere the market could use one. My dream garage would include my VStar 950 Tourer, and I would add a VStar 1300 Deluxe, a Victory Cross Country, an Indian Chieftan, and a Cam Spyder. I will also accept donations towards the dream should anyone have any excess funds they want to contribute. LOL! I live in a year round riding environment, Dallas TX, except for yesterday, today, tonight when we get some snow, and perhaps the rest of the week or month.